In preparation for a course I will be teaching this fall, I have been reading about and researching e-book data formats and display devices. There is an impressive array of devices already on the market, or on their way to market, but it is hard not to think that something might be out of sequence here, since there is a dearth of content for these devices. Back in 2003 at the Frankfurt Book Fair I wandered into its new technology hall and was overwhelmed by the number of e-book readers on offer. The booths were fabulous, stocked with flashy devices and cadres of young and eager women to show them off (the readers, that is). What struck me then is that, for one, I knew only a handful of people who had a clue what an e-book was, and knew even fewer who had actually read one or even wanted to read one. Not surprisingly, virtually all of those products–and many of the companies offering them–disappeared from the face of the earth. So it goes with some ideas funded by venture capital. Now it is 2009, and the e-book charge is on again, led largely by industry titans Amazon and Sony. What is interesting about both of those firms, in contrast to those of 2003 and many of the others dabbling in readers in 2009, is that they have direct ties to content. Any publisher with half a brain picks up the phone when Amazon calls, and Sony is of course as much a media company as a hardware seller. Beyond those two, however, there are other companies rolling out readers: Plastic Logic, Polymer Vision, Fujitsu, et al. It is hard to see how this is much different than 2003, in other words, is this still not putting the technology cart before the content horse? Thanks to the unresolved DRM issues that haunt e-books and their adoption, none of the devices on the market or planned for the market can handle all data formats. Sure, there is a small market of overcashed executives who will pay for such gadgets to read their internal PDF documents (and have IT staff to make it all work), but that is hardly a sustainable business model, not least in this fiscal climate. A casual Web search reveals the myriad frustrations of people who have purchased readers. Clipping limits, lack of content, and pricing policies, among other topics, come up again and again. Beyond that, it is by anyone’s estimation still a fledgling market, with a fairly small target audience of early adopters and technology pioneers. Why then, is there such a steady stream of technology companies developing consumer-level reading devices? One of them, Polymer Vision, bought the farm before they even launched their product. If I am a venture capitalist and someone says “ereader” in their pitch, I am heading for the door. 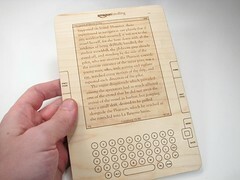 It is likely inevitable that e-books will rule the reading world in the not-too-distant future. This is not a screed about the beloved book and its eternal viability. What appears to be happening, however, is that the ‘easily’ solvable problem–i.e.- creating reasonably priced and feature-rich hardware–was solved years ago and the solutions continue to evolve. That is surely a good thing. The much more difficult problem to solve, where the whole market begins to unravel, is how to deal with content. Kindle is likely the leader in terms of the number of available titles, with somewhere in the neighborhood of 300,000 up for grabs as of August 2009. That is still a pittance compared to the number of new titles appearing worldwide, let alone those that came before. I do not propose to have the solutions for rights management, but clearly the publishers need to get on the ball to kickstart this market. Where there is content, there are readers/users. A cool device that frustrates me or, worse, limits my reading scope to those publishers with whom the distributor could strike a deal, is not going to light the world on fire. Oh, and speaking of the world, that is one of the most damnable aspects of the whole e-book business. None of this stuff moves across international borders, at all, completely ignoring how many of the people with the disposable income to purchase such a device live their digital lives. I could buy a Kindle in Germany, but cannot download books via the built-in wireless card, only by pulling them to my computer and uploading them via USB. No thanks. I do not pay for features I cannot use. Conversely, when in the US, virtually any German content is off-limits to me, since German publishers nearly never license their digital content for the entire world, which is shortsighted, not least when you consider how many expatriate Germans are out there and that getting information digitally just might make sense for them. This is truly an area where the publishers have been so eager to protect their assets that they have missed these global opportunities. You’re preparing a course about e-book formats and display devices? This (too) sounds very interesting!